Mainstream Linux distributions such as the ever-popular Ubuntu have the potential to contain thousands or tens of thousands of packages and have a wealth of supporting services activated on computer boot ups. Mark G. Sobell’s book A practical guide to Ubuntu Linux, published by Prentice Hall, describes the details of maintaining these complex structures on your own machine. My first impression of the book was that the content was well chosen and relatively timeless. Rather than dwelling on particular superficial features, Ubuntu Linux's underlying structures are described in great detail. The benefit of this is that the content will remain valid despite the frequent updates we see in today’s competitive market place. 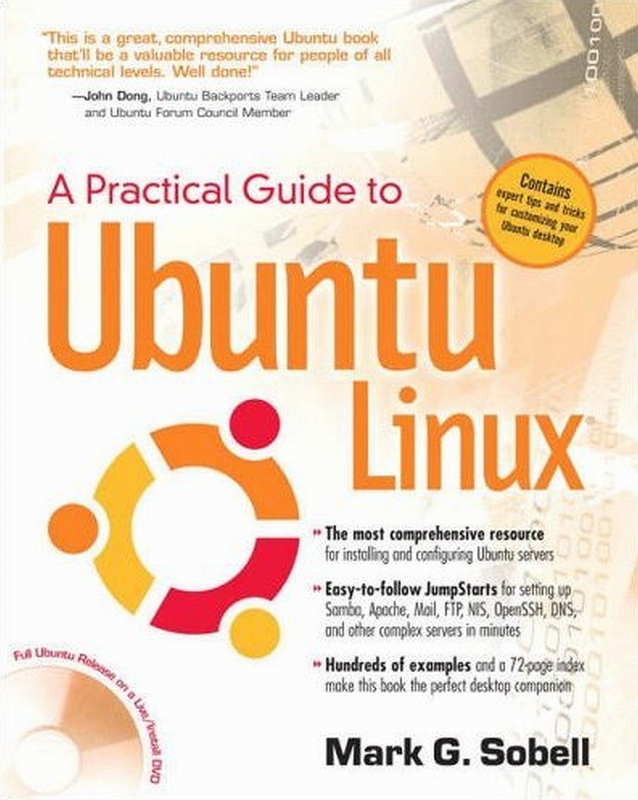 Even though the author based the content on Ubuntu 7.10, the book is generic enough to be true in most Linux based situations. The book is self-contained with a Live CD and books source code included for quick installation. By the time you have finished reading you should be able to maintain an Ubuntu server or two. This practical guide is composed of 1200 pages divided into six sections, and twenty-seven chapters and five appendixes. Mark G. Sobell explains installation, basic practical concepts, maintaining the system and details a lot about the client and server side of Linux and specifically Ubuntu 7.10. If you are new to Linux and are moving away from Windows, with a little patience and a bit of trial and error you’ll find that this book will guide you layer by layer into the right mind and skill set. The book contains many listings and screen grabs, helping readers find their way through the wealth of tools. After describing installation, there are two excellent chapters (9,11) on the Bourne Again Shell. I suspect I will reread them a couple more times when I am repairing systems that I have broken. Section four covers System Administration and is a delight to read. This is the meat of the book and in my opinion is the most useful. A clear and crisp description of the init daemon helps set a well thought out learning path. Section five, Using Clients and Setting Up Servers, explains essentials such as ssh, scp, FTP, NIS, NFS, exim4, spamassassin. The final chapter on the Apache web server is handy for those of you who like maintaining their own web site. This book is for the practical and pragmatic Linux owner that happens to be running Ubuntu. Linux is free software. Ubuntu is a shaped version of Linux with a lot of communal effort and polish behind it. Ubuntu has built a reputation for creating an excellent experience for desktop orientated owners and then later for server administration. Mark G. Sobell’s book discusses free software only, and helps build the necessary knowledge to run services on top of Ubuntu. This book is thorough and detailed, with enough digestible information to make a motivated reader into a plausible administrator. The book discusses Ubuntu 7.10; however, Ubuntu 8.04 has just arrived. Personally, I don’t think this as much of a detractor as the book is generic enough remain very relevant.